Ultra swinging and sliding patio doors are the perfect way to invite the beauty of the outdoors in. Now, you can bathe in the light of a sunny afternoon while shielding your home – and your door – from the elements. The strength of fiberglass protects your investment from the harsher side of Mother Nature. It’s even paintable to suit your custom color taste. 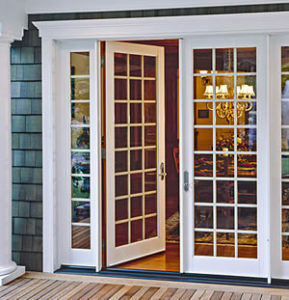 Ultra’s swing door has a traditional French door look with the superior durability, strength and weather resistance of fiberglass. Feel safer with the increased security and performance of our multi-point stainless steel locking system. To achieve the exact look you want, order in any of our factory-painted colors (guaranteed not to peel or eggshell) or in a custom color applied at the factory. You can also paint the door yourself. Ultra’s French-style sliding door combines the upscale look of a French door with the space-saving design of a sliding door. Buy doors as strong as they are beautiful. Our patented process for mechanically joined corners increases strength and durability. Choose from a large selection of hardware and grid options, including our dual-point locking system for enhanced security.